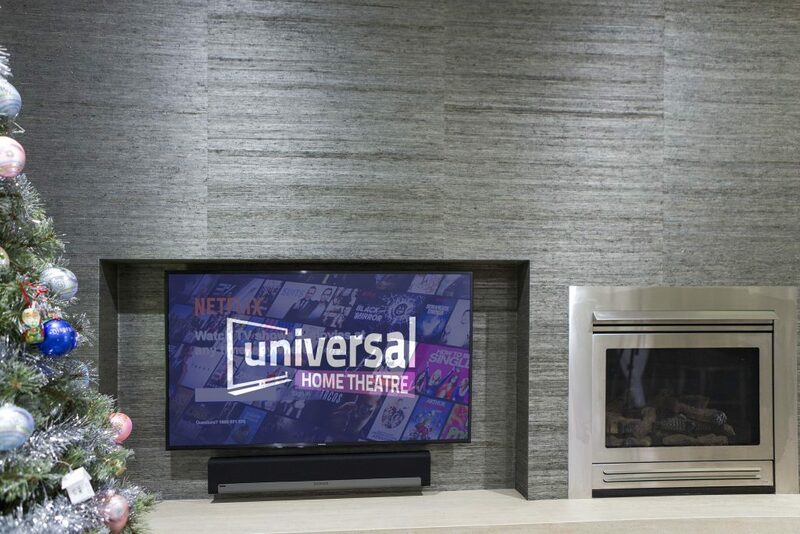 Universal Home Theatre are proud to showcase a recently completed job fully designed, supplied and installed in Harrington Park. 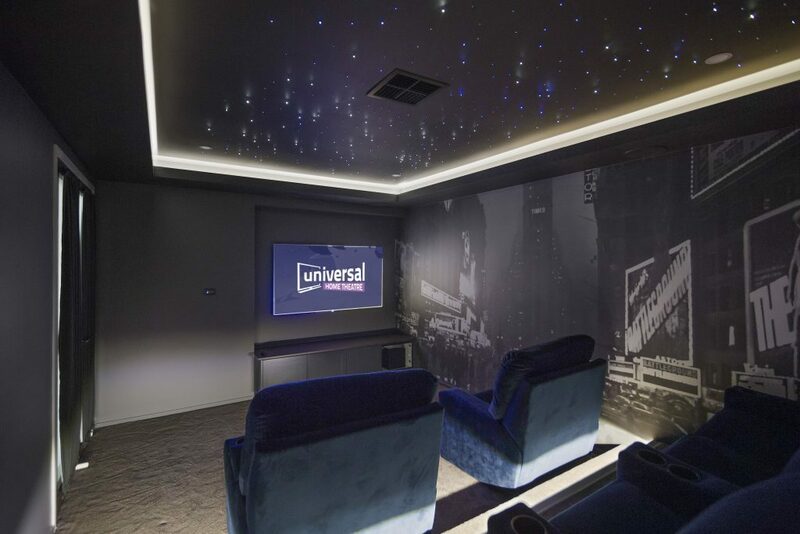 Universal can provide two solutions for your star ceiling effect in your theatre room. Sky@Nightstar panels use long life LED light source through fibre optic arrays. The standard size is 600mm X 1200mm and are made using a lightweight polymer 20mm deep and can have either random twinkle or static. These panels can also be custom cut to size depending on the application and or size of the room we are installing in. The long haul application of installing 250 – 1000 (depending on which kit you choose) optic fibres in your ceiling. This process generally looks better as we can get more fibres in the places we require in the room and doesn’t require moving air con vents or lights etc, which we can work around. This option requires us to drill 250 – 1000 1.5mm holes in the ceiling and placing the fibres in, once this is done we have the ceiling painted in a dark colour then trim all of the fibres back. We then install a fibre spinning light wheel which gives the twinkle effect. This 7.1 Home Theatre System is powered and driven by the immersive Yamaha AVENTAGE RXA1060 receiver which is a 7 channel Dolby Atmos capable amplifier. Features include built in Wifi, Bluetooth, Pandora, Spotify, Yamaha Music Cast, with a new addition of Control4 compatibility. The dynamics of the AVENTAGE receiver work seamlessly with the Jamo speakers, and add a new level of dimensionality to the theatre sound stage. The theatre room has a neat, and clean aesthetic finish using Jamo In-Ceiling speakers for all 7 channels. For a deeper bass response and fuller overall sound from the front stage, Universal Home Theatre has opted to use the 10” LCR Jamo In-Ceiling speakers. The subtle yet, dynamic rear stage has been equipped with the 8” Jamo IC608 LCR speakers, assisted by the powerful yet smooth Sunfire HRS10 subwoofer. Sonos is our preferred brand when designing a Multiroom Audio Distribution system. Using Sonos Connect: Amps, a Sonos Playbar and Subwoofer the customer is able to easily select any song from their preferred streaming service such as Spotify, Pandora, Tidal or Google Play. The system is capable of having all rooms designed with Sonos to play the same audio source, or its own independent music through streaming services or playback from a shared media source. Essentially, you can have music play throughout the entire house at one time, or independently control each room at your own leisure. 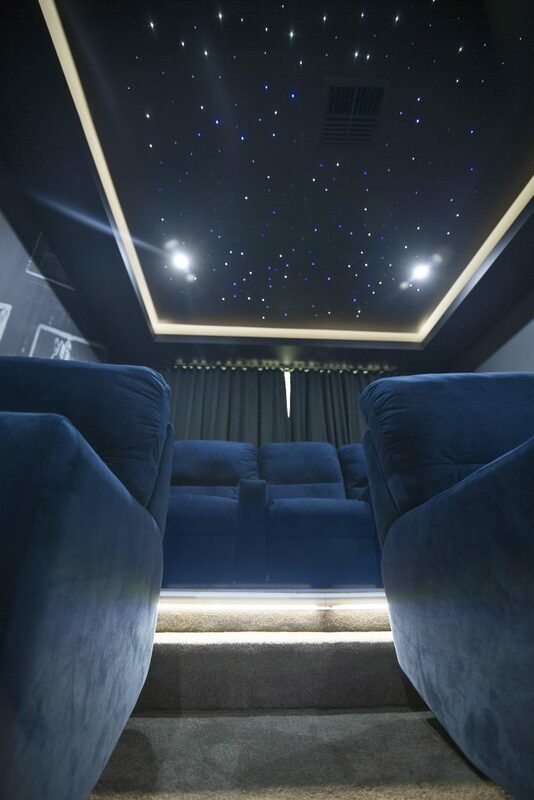 One of the key features in this theatre room is the star light ceiling and LED step up lights installed by Universal Home Theatre. This cinema addition assists in opening the overall feel of the room, creating a calming and serene atmosphere that is sure to be the envy of many friends and family. 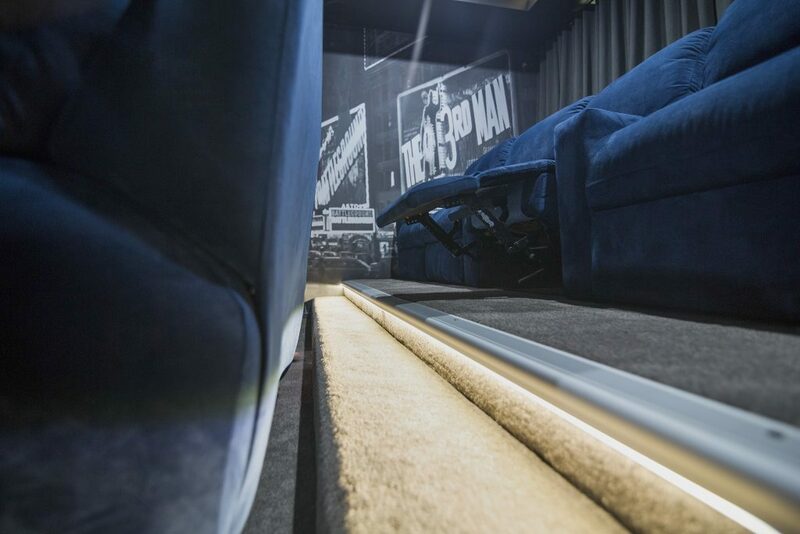 The LED step up lights create a new level of professionalism and makes you feel as if you’re in a commercial grade theatre room, which can also be used in a multitude of applications. Several more TV’s have also been installed in this customers’ home. Samsung has also been our preferred television brand and we are happy to continue supporting them as they continue to grow as one of the leading brands in AV and vision.